Informal learning has been around for forever and is a part of our daily lives. The advent of social media in the current digital age has added a new dimension to informal learning, making it more effective. Most of the informal learning is accidental and directionless. However, organizations and learning services providers are beginning to tap this unexploited and magnificent source of information and making this learning intentional, bringing in a paradigm shift in education. Collaborative platforms like wikis, social networking tools, blogs, YouTube etc. form an integral part of informal or social learning. Informal learning is like having a GPS, rather than a roadmap, used for finding your own route. The premise is that without formalizing informal learning by pushing it, the learner should be given the freedom to pull the information as per the learning needs. Pulling information gives more control to the learners who set their own objectives and learn what they really need to know. Greatest challenge for a learning and development team, or learning services provider, is to move from the traditional roles of designers, developers, deliverers, and managers of learning to facilitators of learning, and performance consultants. The learning methodology is constantly changing, and a blend of approaches (oral, written, formal, informal, hands-on, and experiential learning) comprises the learning portfolio. For over a decade now, a portion of learning, in the above blend, is happening through eLearning. With the ever-evolving technology and the dependence of eLearning on the trending software, it is imperative that the technology standard ensures interoperability between eLearning software products and learning management systems (LMS). SCORM has been a set standard for eLearning on LMS hosting. SCORM has been able to track the data such as completion status, pass/fail, and assessment scores. However, limited data points have done little to get substantial data for data analytics to cull out the learning impact and calculate the return on investment (ROI). This is where Tin Can API (application programming interface) or experience API comes in. The Tin Can API is the new standard developed to facilitate the communication between various learning systems. The Experience API (xAPI) monitors various data points and provides a comprehensive learning analytics. Unlike SCORM design constraints, the experience API is not limited to eLearning courses and LMS. The experience API monitors and manages learning that happens in the workplace through activities such as coaching and feedback, knowledge sharing, work assignments, and other work experiences. These learning activities pertaining to work experiences, happening through organizational networks and/or social media, can be termed as informal learning. The xAPI can track the completion of courses, as done by traditional SCORM compliant LMSs, and also track and store records of all learner activities pertaining to work tasks done using computers and organizational networks. Formal learning accounts for only 10% of all learning – a fact. Informal and incidental learning contributes to 80-90% of learning – another fact. However, formal and informal learning, together, form a learning continuum, which could be interspersed with each other. 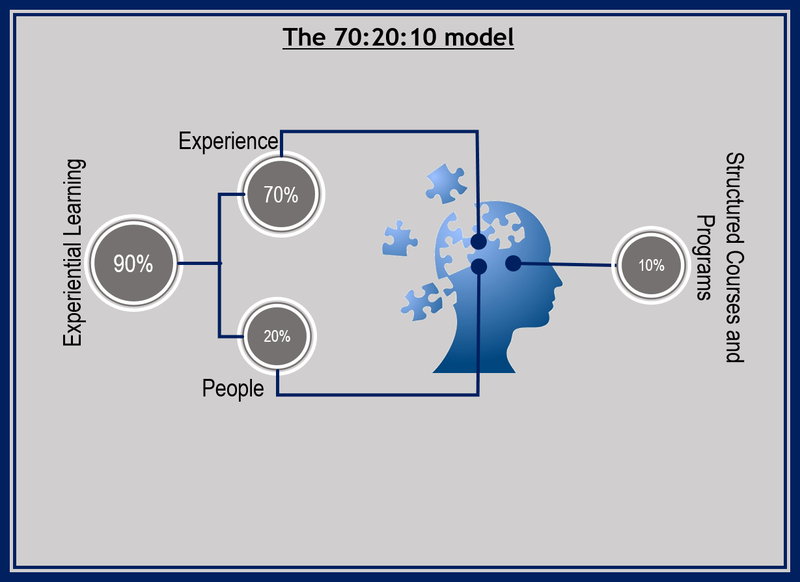 The 70:20:10 model fits beautifully with informal or social learning paradigm. All learning may be intentional, or incidental, or both. 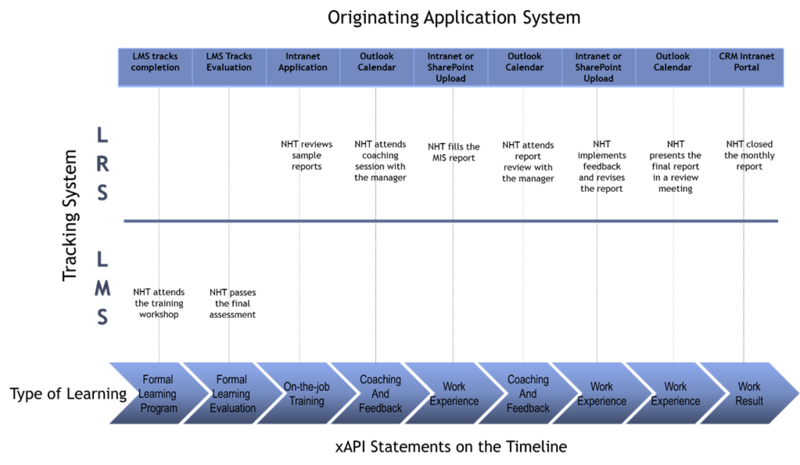 How can you track informal learning along with the formal/traditional learning? How can you track incidental learning that may not be a part of the formal learning design? How does xAPI come into the picture? A typical Learning Management System (LMS) maintains the repository of content, schedules training, enables self-registration, handles notifications and approvals, tracks attendance and course completions, provides certificates, manages instructors, facilities, and resources, etc. Imagine if this LMS is also able to communicate with knowledge bases, collaboration platforms, document management systems, enterprise resource planning (ERP) systems, helpdesk systems, portals, talent management, performance management, and other types of systems used at a workplace or a university. It will then be able to track actual work inputs, outputs, deliverables, tasks, and more. This is where xAPI does tracking of all work inputs and learning experiences. When a system or business unit works on certain pre-defined activities and a few of these are performed on the organizational portal, xAPI tracks and records each activity as a statement. Each statement has an actor (performer), an action, and an object. This activity statement is recorded as an experience and is relayed to the LRS (Learning Record Store). 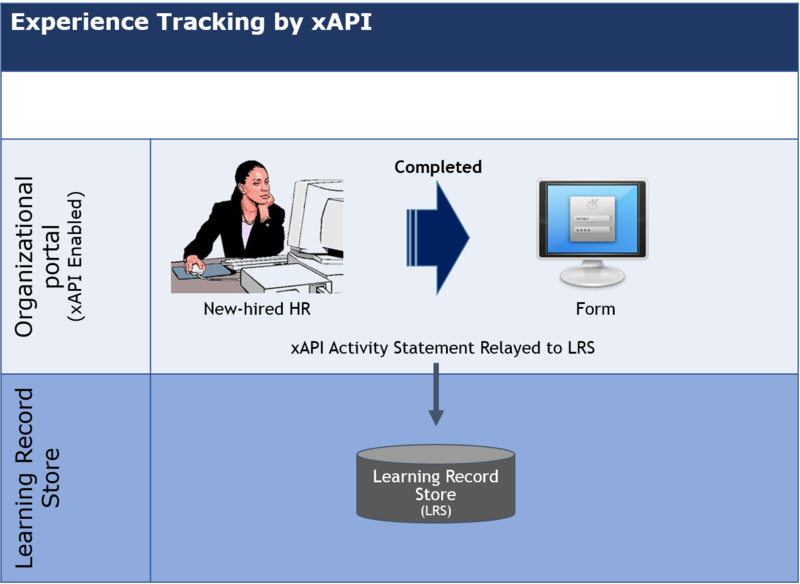 Let us take an example: If a new hired HR personnel (actor) completes (action) the first MIS report for all absenteeism in a month (object), the xAPI enabled intranet portal records this report as an activity statement and relays it to an LRS. Tracking traditional training on an LMS gives the manager an account of the completion of scheduled learning programs for the identified group of learners. Tracking ‘transfer of learning’ to the job has always been a challenge for the instructional and course designers, as well as, the managers. This has added to the woes of the organizations that are trying to calculate the return on investment (ROI) of all learning programs. How does one track learning, informal, and social? Can we track on-the-job learning? Experience API is a step in that direction, tracking all learning participation, and monitoring performance growth. The training workshops and assessments are a part of the formal learning. The completion status and assessment results are recorded on the LMS. The reports can be generated for each learning course, or workshop, from the LMS for analytics. On the other hand, all work activities, like the calendar entry for a coaching and feedback session with the manager, and files accessed or uploaded on an organizational portal or shared folder, get recorded as experiences by xAPI on LRS. The new-hired HR agent uploads the MIS form on SharePoint. This is accessible to the manager, and the team for any further use, analysis, and updates. Experience API tracks the coaching schedules, meetings, uploaded reports, and records them as experience statements. This can be used for monitoring the complete learning flow and deducing the learning curve. The records, generated as reports, can help in a performance review. Some of the eLearning authoring tools have already adopted xAPI. The latest LMSs are providing LRS and xAPI integration. Saba Cloud is already capturing experiential and informal learning and storing the results in its Learning Record Store. Articulate Storyline and Adobe Captivate 7+ support xAPI. Lectora V11 supports xAPI. All aspects of learning, from WBT to simulations to gaming to mobile learning to informal and social learning, is exploring xAPI to collate all forms of learning data and experiences. It is imperative that LRS will become an integral part of all institutions and organizations for xAPI adoption. Learning is happening everywhere. Experience API, or xAPI, is capturing it by making each learning activity traceable and quantifiable. The future is here. This entry was posted in Technical and tagged API, experience API, industry adoption, informal learning, LMS, LRS, SCORM, social learning, tin can, xAPI. Bookmark the permalink.